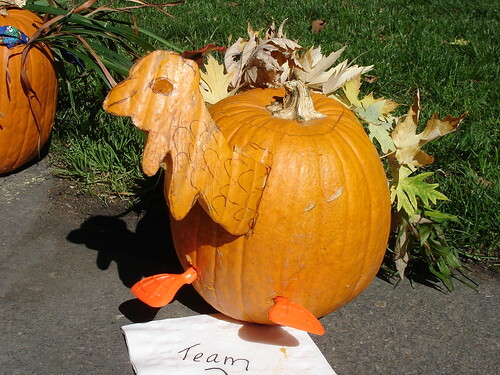 Turkey Pumpkin, originally uploaded by in2jazz. Note: No turkeys were harmed in the making of this carving. I guess I am a bit square when it comes to Halloween. I usually don’t got out to parties nor do I dress up in costume. It amazes me how commercial Halloween has become over the last few years. However, I will take photos of cool costumes and eat up your candy, if you offer it to me. People dress up their homes like they would for Christmas with lights and other decorations. I went to San Francisco the first year I moved here and it was like “night of the living dead” for there were people everywhere. I got called a party pooper yesterday when I mentioned to a friend that I would be spending a quiet evening at home. Tomorrow is November 1. Time to starting thinking about the holidays. I will be home for the holidays this year. I usually go home for Thanksgiving but I decided that I wanted to stay home this year. I have never cooked a Thanksgiving dinner for myself so this may be my first year. Of course, I will be gearing up for all the holiday baking. Right before Thanksgiving is a great time to stock up on all your holiday baking supplies. There are usually some great sales. Speaking of baking, I was sent this recipe for Bill Nicholson’s Krispy Kreme Bread Pudding with Butter Rum Sauce. Are you feeling your arteries clogging yet? You know I am tempted to make this just once. My dad loved breading pudding but I am sure this would have been a bit much for him. Whatever you decide to do tonight, have a happy and safe Halloween and save me some candy! Feeling Orange, originally uploaded by in2jazz. 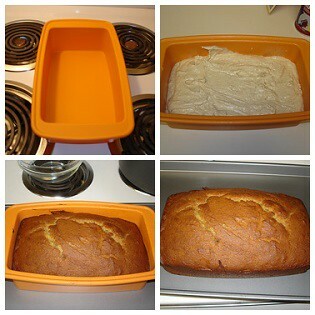 This is my new orange silicon loaf pan and I made banana bread in it. Being an old school baker, I was a little caution about trying this type of pan. I got it for $10 so I would not feel too bad if I did not like it. Preparation for use is the same as with a steel or aluminum. Place a light coat of cooking spray in the pan before adding the batter. Also, place a cookie sheet under the pan since it will wobble. Amazingly, this pan can handle up to 500 degrees. Notice how the silicon pan expands to accommodate the bread which means it will not rise as high as it would in an aluminum pan. After cooling for a bit, the banana bread came out of the pan very easily. I may have to try out the silicon bundt pan though I am partial to my cast aluminum bundt pans. I added about 10 minutes to my baking time. The bread cooked evenly without any mushy spots. Blackberry Bistro, originally uploaded by in2jazz. 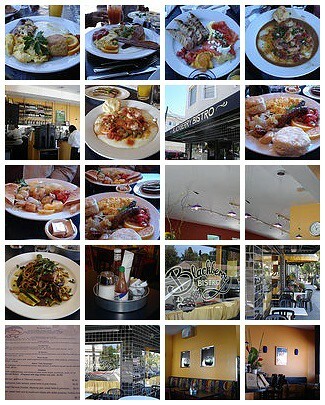 This is a mosaic of all the photos that I have taken at Blackberry Bistro. Tuesday Lunch Special @ Blackberry Bistro, originally uploaded by in2jazz. 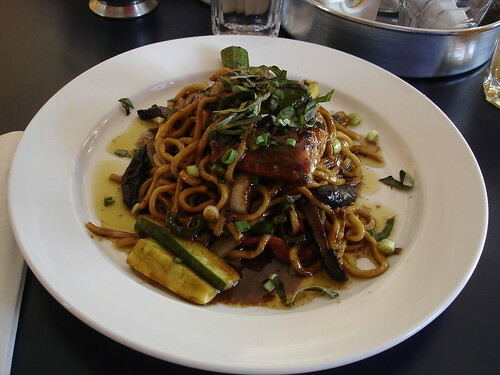 Salmon on a bed of honey glazed noodles with an assortment of vegetables. This very tasty! Burger Meister, originally uploaded by in2jazz. A guilty pleasure but I do not put a pound of cholesterol in my arteries too often. 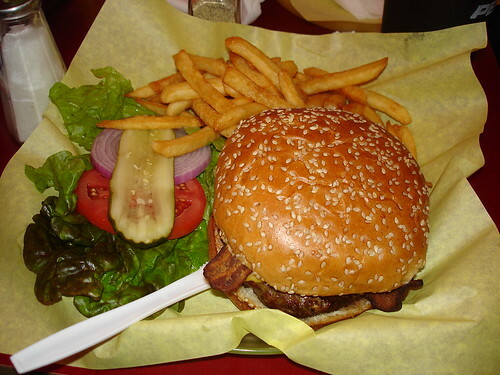 The bacon cheeseburger here is very tasty. The shake are great here but I was good and did not have one this day. You are currently viewing the archives for October, 2005 at Simply J Life.